Vietnamese - Fresh and Tasty! Harry & Sons Do Sushi! Over Memorial Day weekend I spent time with family on Martha's Vineyard. Lucky for me, my aunt and uncle have a house there. We had a fabulous time, the weather was great and the food was yum yum yum! My Aunt and Uncle's House on the Vineyard. Available for rental here. View on the way to the beach - about a five minute walk from the house. The water was pretty cold, but it warms up nicely later in the summer. We had a lovely lunch at Art Cliff, a small cafe with delicious food. They serve a wide variety of crepes, breakfast foods, sandwiches and salads. One meat sandwich and one veggie! Curried chicken salad - the orange stuff on top was either fried carrot or fried sweet potato! Plain crepe with sugar and lemon juice - I had to indulge myself for dessert as this was too good to pass up! OK so we had to eat a lot of smoked shrimp and crab dip... just like this... with crackers! Lynn made a delicious chicken with peanut and veggie pasta. Plum TV, Amanda's place of employment. We hiked down to another beach one day. The weather was perfect and yours truly really enjoyed it. Picturesque bench on our hike. Front of Chesca's, the fancy place we went in Edgartown. It was delicious. Wonderful bread and cracker assortment with butter and white bean spread. They had bento box specials, including this one with salmon. Lobster ravioli with huge scallops. The desserts were out of this world! We had a brownie sundae and a wonderfully creamy custard with raspberries. I'm drooling just thinking about it. Our whole crew at lunch on the Vineyard. Mad Martha's. Some fine ice cream. The famous Black Dog chain - this is the Cafe. Pastries and cakes at The Black Dog. The apple fritter is awesome and worth every last calorie! Vietnamese is one of my favorite cuisines. In Atlanta there are several great places for pho (beef noodle soup) and vermicelli bowls. Of course I always get the fresh spring rolls, too, but I think I forgot to take a photo this time. The photos above are from Pho Dai Loi #2, one of my standards. I have had more trouble finding banh xeo (Vietnamese yellow pancake), although I have had it at Nam (upscale Vietnamese place in Midtown) and I've seen it on Lee's Bakery menu. I will have to try it next time! Friday night I went to Nicola's with about 12 people from the Buford Highway Meetup Group. We dined family style and enjoyed the entertainment provided by belly dancers and Nicola, the owner who can himself dance to the music. At one point I think our whole group was dancing! The food was tasty and we had several entree dishes that are not pictured here. It did seem, however, that they did not provide the amount of food that we paid for and when we asked if we could have a few of the dishes refilled, two of the staff said "No." That's not good business sense, but I think everyone still had a good time just enjoying the scene. Nicola serving a beer - watch the video for the full effect! This week I returned to Machu Picchu, one of Atlanta's few Peruvian restaurants. Although recent reports on Citysearch were negative, I found the food to be delicious and the service decent. I love any kind of raw fish or fish that's close to raw, so the ceviche was right up my alley. I also tasted the cooked seafood rice special, which tasted like a good, hearty paella. We also shared an empanada (strangely, this appetizer arrived after our entrees), which was tasty, as many fried pieces of dough are. I would return here in the future, although the prices are higher than many other Buford Highway dining establishments. This week I had the pleasure of driving to Warner Robins, Georgia two times for work. While I was there I decided to check out the barbecue selection. First I tried Fincher's (food pictured above). The sauce seemed to drown out the taste of the barbecue, but it was still tasty. They have several locations in Warner Robins and in Macon. The next day I had lunch at When Pigs Fly BBQ where I had some tasty pulled pork, cole slaw and fried okra (not pictured). I found this place superior to Fincher's, mostly because it was served without sauce and there were three varieties of sauce for you to use to dress your own 'cue. I met up with a couple of colleagues at the Moreland Avenue location of Front Page News. We discussed our child advocacy and adoption law experiences and dined on some decent bar food. My turkey wrap was pretty good, with tasty, no mayo pasta salad and the spinach dip had a lot of real spinach in it. The atmosphere is what this place is all about, though, with a huge outdoor patio and bar with fountain. I'm not sure how, but I lived in Atlanta for over six months before discovering that good, fresh and not outrageously priced sushi is available on Highland Avenue, within walking distance of my stomping grounds. 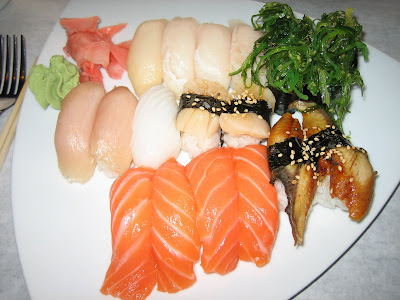 Harry & Sons, which is owned by the folks who own Surin of Thailand, is a nice spot for sushi. Thai dishes are also served. The salmon nigri, above, was excellent. I may be biased, however, as salmon is my favorite kind of sushi. We also tried the seaweed salad and two of the sushi combos. Everything was tasty and nothing was left at the end of the meal. Ben & Jerry's is right down the street, so if you crave a sweet treat afterwards, that is one good option. On another visit (3/24/2009) I arrived in time for the $1 sushi menu, which is available Monday through Wednesday from 5:30 to 7:00 PM. The sushi was delicious and a great deal for sure! 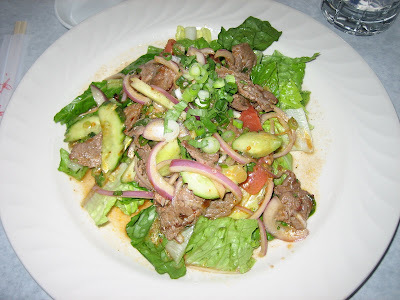 I also sampled the spicy beef salad, which had a wonderfully spicy, tangy dressing. Sushi from the $1 menu - more salmon!